According to recorded excerpts of private remarks, he said evangelicals were "one election away from losing everything." But Trump cited this alleged accomplishment as one in a series of gains he has made for his conservative Christian supporters, as he warned, "You're one election away from losing everything that you've got," and said their opponents were "violent people" who would overturn these gains "violently." The law that Trump says he got rid of is the so-called Johnson Amendment, a provision inserted into law in 1954 by then-senator and future President Lyndon Johnson of Texas, who was miffed that a conservative nonprofit group was helping his opponent. The law says churches and charities "are absolutely prohibited from directly or indirectly participating in, or intervening in, any political campaign on behalf of (or in opposition to) any candidate for elective public office." "Now one of the things I'm most proud of is getting rid of the Johnson Amendment," the president said. "That was a disaster for you." The president doesn't have the power to repeal a law — only Congress can do that. The Supreme Court can also rule a law unconstitutional, but that has not happened in this case. In May 2017, Trump signed an executive order that purported to ease enforcement of the Johnson Amendment. But experts — and the American Civil Liberties Union, which opposes repeal of the provision — say the Trump order was basically toothless. "It does almost nothing," Gregory Magarian, a constitutional law professor at Washington University Law School. Politifact, the nonpartisan fact-checking organization, rated Trump's claim that he had gotten rid of the Johnson Amendment "mostly false" when he first made it publicly in July 2017. The law forbids religious organizations and other charities from formally endorsing candidates if they want to retain their federal tax exemption. Trump's executive order instructs the Treasury Department not to "take any adverse action against any individual, house of worship, or other religious organization on the basis that such individual or organization speaks or has spoken about moral or political issues from a religious perspective, where speech of similar character has, consistent with law, not ordinarily been treated as participation or intervention in a political campaign on behalf of (or in opposition to) a candidate for public office … "
In other words, religious organizations can express their religious views, as they always could — but still cannot formally participate in political campaigns. Trump said to the religious leaders at the White House: "Now you're not silenced anymore. It's gone and there's no penalty anymore and if you like somebody or if you don't like somebody you can go out and say, 'This man is going to be great for evangelicals, or for Christianity or for another religion. This person is somebody that I like and I'm going to talk about it on Sunday." In practice, there has been nothing stopping anyone from doing that. The Johnson Amendment doesn't prohibit individual speech, and it has rarely been enforced. More than 2,000 mainly evangelical Christian clergy have deliberately violated the law since 2008 as a form of protest against it, but only one has been audited by the IRS, and none punished, according to the Alliance Defending Freedom, a pro-religious group. Trump "doesn't have the legal authority to overturn the Johnson Amendment," Magarian said. "You would think," Magarian added, "that the conservative religious leaders would get impatient at the continued repetition of that claim" that Trump has repealed it. "I had the great Robert Jeffress back there. Hello, Robert. 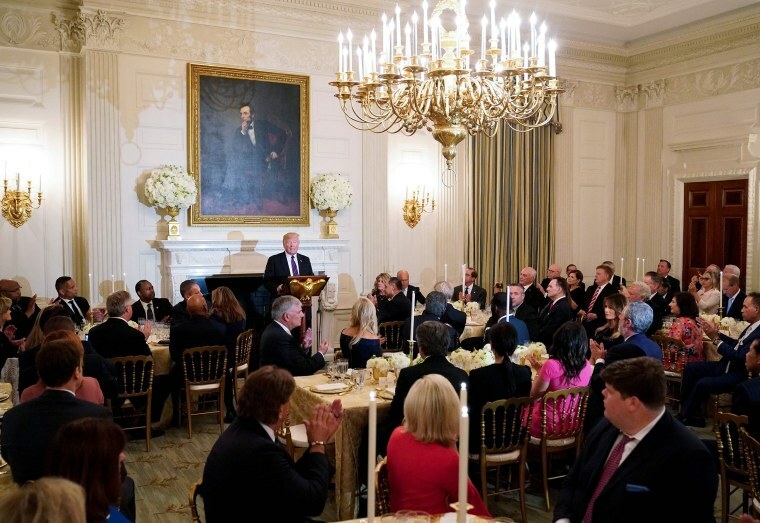 Who said about me: He may not be the perfect human being, but he is the greatest leader for Christianity," Trump said to applause and laughter. He added: "Hopefully I've proven that to be a fact in terms of the second part. Not the first part." "Little thing — Merry Christmas. You couldn't say Merry Christmas," Trump said. "I'm telling you — when I started running I used to talk about it and I hate to mention it in August, but I used to talk about it. They don't say Merry Christmas anymore." Trump added, to applause: "They say Merry Christmas a lot right now. It's all changed. It's all changed."